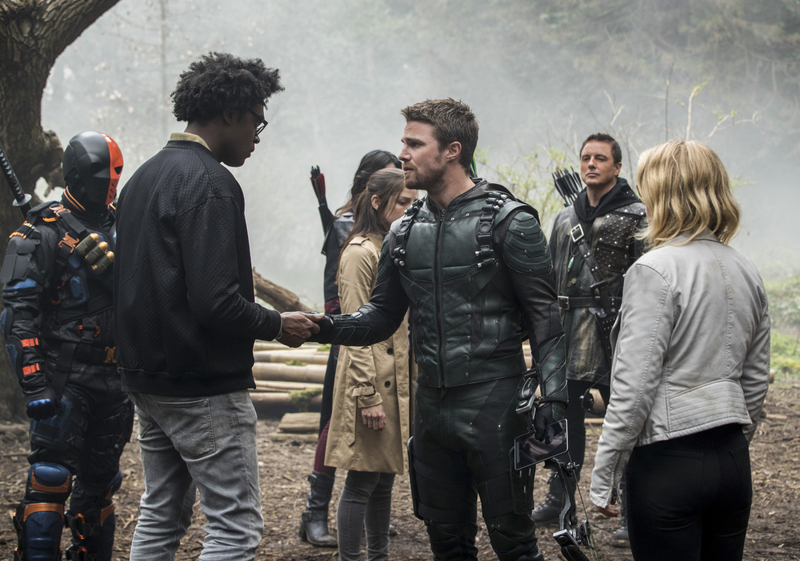 Arrow -- "Lian Yu" -- Image AR523a_0502b.jpg -- Pictured (L-R): Deathstroke, Echo Kellum as Curtis Holt/Mr.Terrific, Anne Hopkins as Samantha, Stephen Amell as Oliver Queen/The Green Arrow, John Barrowman as Malcolm Merlyn, and Emily Bett Rickards as Felicity Smoak -- Photo: Jack Rowand/The CW -- ÃÂ© 2017 The CW Network, LLC. All Rights Reserved. We get a little narration that is a throwback to the Pilot and we come full circle with the flashback. Oliver is on the run and is being chased around the island by Kovar and his men. Oliver takes them out one by one and brings down a helicopter that contained Kovar. The two men fight and Kovar tells Oliver that he has run out of time because the boat that will bring him home is about the pass by. Oliver manages to snap Kovar’s neck and we see him put on his island wig and tattered garb to alert the boat as in the Pilot. When Oliver is on the boat, he calls him mom to let her know that he is alive and well. It is an emotionally scene and great to see Moira back. In the present day, we start where we left off with Oliver reaching out to Slade and getting his help in defeating Chase. Slade lets Oliver know the affects of the Mirakuru have worn off and he of right mind again. Slade doesn’t understand why Oliver wants his help considering he killed his mom. Oliver tells Slade that Chase has his son and appeals father to father for help in rescuing him. Oliver has also recruited Digger Harkness aka Captain Boomerang to join his mission. Arrow — “Lian Yu” — Image AR523a_1013b.jpg — Pictured (L-R): Anne Hopkins as Samantha, Willa Holland as Thea Queen / Speedy, Stephen Amell as Oliver Queen/The Green Arrow, Echo Kellum as Curtis Holt/Mr.Terrific, Deathstroke, and Emily Bett Rickards as Felicity Smoak — Photo: Jack Rowand/The CW — ÃÂ© 2017 The CW Network, LLC. All Rights Reserved. Nyssa and Malcolm are snipping at each other but Oliver needs them to work together. Oliver, Slade and Harkness take off and find Anna, Curtis, Thea and Felicity in cages and unguarded. It is a trap as out comes Talia and Evelyn. Harkness then turns on Oliver and company saying Chase offered him a better deal. Harkness then asks if Slade will join the winning side. It looks like Slade chose Chase’s side when he suggested Evelyn place a gun to Oliver’s head but this was a ruse for him to take her down. Just when we think hell will break loose, Nyssa and Malcolm arrive. Talia throws down a smoke bomb and disappears leaving Evelyn. Arrow — “Lian Yu” — Image AR523a_0222b.jpg — Pictured (L-R): Bett Rickards as Felicity Smoak and Stephen Amell as Oliver Queen/The Green Arrow — Photo: Jack Rowand/The CW — ÃÂ© 2017 The CW Network, LLC. All Rights Reserved. Nyssa, Oliver and Slade are on the trail of Talia. Slade tells Oliver that he is feeling guilty over his father’s suicide that has driven him to everything after that and he needs to forgive himselm. On the way to Chase’s plane, Samantha tells Felicity that she is staying on the island to find William. Thea has stepped on a landmine. The trigger is rusted meaning it can’t be disarmed so Malcolm shoves Thea out of the way taking her place. Thea tells Malcolm he doesn’t have to sacrifice himself for her but he says he does and that she will always be his daughter. When the group flees, Harkness and Talia’s men come across Malcolm thinking they have the upper hand but we see an explosion happen. Thea doesn’t quite understand why she is mourning Malcolm. Felicity offers an explanation and comfort. Curtis then alerts the women that he has found the plane. The bad news is that there are tons of explosives scattered around the plane and the island making it impossible to disarm. Thea implores the genius of Felicity and Curtis to figure out a way to disarm the bombs. Quentin and Diggle are brought to Rene and Dinah by Black Siren to some sort of temple. We learn Dinah’s powers are being dampened. Oliver, Slade and Nyssa are making their way to the same temple and once inside they split up. Slade then knocks out Oliver telling Black Siren that he has a gift for Chase. Oliver is thrown in with Diggle, Rene, Quentin and Dinah. Oliver passes along Curtis device for Dinah that allows her to use powers to set everyone free. Elsewhere in the temple, we get Talia versus Nyssa in a sibling battle that I thought would be bit more epic but resulted in Slade taking on Talia’s men and Nyssa knocking out her sister. Arrow — “Lian Yu” — Image AR523b_0041b.jpg — Pictured (L-R): Katrina Law as Nyssa al Ghul, David Ramsey as John Diggle/Spartan, Deathstroke, and Juliana Harkavy as Tina Boland/Dinah Drake — Photo: Dean Buscher /The CW — ÃÂ© 2017 The CW Network, LLC. All Rights Reserved. Arrow — “Lian Yu” — Image AR523b_0094b.jpg — Pictured (L-R): Katie Cassidy as Black Siren and Josh Segarra as Adrian Chase — Photo: Dean Buscher /The CW — ÃÂ© 2017 The CW Network, LLC. All Rights Reserved. It looks like Slade’s betrayal was part of Oliver’s plan to be taking to Dinah so he can pass along Curtis’ device. Oliver asks Slade if he found her son but alas no. Chase then arrives to confront Team Arrow. We get Team Prometheus versus Team Arrow. We also get Black Canary versus Black Siren and it is pretty cool when both use their canary cries at the same time that knocked each other back. Black Siren taunts Dinah but Quentin knocks her out. Arrow — “Lian Yu” — Image AR523b_0504b.jpg — Pictured (L-R): Josh Segarra as Adrian Chase and Stephen Amell as Oliver Queen/The Green Arrow — Photo: Dean Buscher /The CW — ÃÂ© 2017 The CW Network, LLC. All Rights Reserved. Meanwhile, Chase and Oliver are going at it. Oliver puts Chase in a deadlock demanding where his son is. Chase refuses and says there is only on way to end things and that is kill him. Oliver refuses and lets him go. Chase then tells Oliver that William is dead but he doesn’t believe him. Felicity then lets Oliver know that he can’t kill Chase because if he does then the whole island blows up. Chase then throws down a smoke bomb and is in the wind. Oliver gets Diggle to take the others to Felicity and safety. Unfortunately, Chase ahs sabotaged the plane and they have no way off the island. The chase is on for Chase that results in a fight between Oliver and Chase on his getaway boat. As the two men beat each other up, Chase still refuses to tell Oliver where William is and he refuses to kill him. When the boat comes to a stop in still waters, Chase then pulls out William and gives Oliver a choice: save his son or save his friends. Oliver knows that if he lets Chase live, he will snap William’s neck but if he kills Chase then everyone on the island blows up. Beforehand, Oliver learns of Chase’s sabotage and tells Felicity et al to go to the ARGUS boat that is on the other side of the island and Slade will lead them there. Oliver’s choice is made and he shoots an arrow at Chase’s leg that allow William to go free. Chase then kills himself setting off the island explosives. Oliver and William see the island go up in a several fireballs.